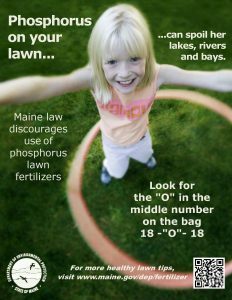 It is important to avoid phosphate in our lawn fertilizer and to use only sustained release nitrogen so as to avoid increasing water vegetation to the extent possible. The following list of lawn service companies have responded and confirmed they do follow these guidelines. All the listed companies service the Little Sebago area. For more information on protecting our lake with fertilizers, click here. Also, as a reminder regarding household cleaners, please be aware that these products such as laundry detergents and other cleaning supplies may contain phosphates as well. Where the waste water around our lake goes directly into the ground by way of septic systems, it is important not to allow this contaminant into our ground waters as well. Always look for safe phosphate-free products to help protect our precious resource.